Have we got a tip for you! How can you focus your intentions to ‪#‎LightUpTheLOVE‬ today? 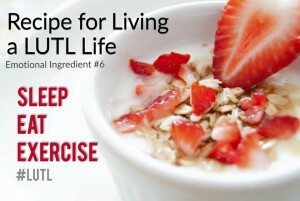 The sixth ingredient to ‪#‎LUTL‬ is “Sleep, Eat and Exercise.” Choose an amount of sleep that is optimal for you, focus on eating a well-balanced diet and enjoy at least 30 minutes of physical exercise each day. Simply walking near your home is always a good option. Now here’s the special part. There’s one more “exercise” we encourage you to add to your #LUTL routine. Don’t forget to focus on your emotional fitness routine. How do you exercise your emotions? Here are some starting ideas: create a vision board, write a daily gratitude, meditate, be of service to others or a cause you are passionate about. And psst, guess what? If you’ve been following along these last five weeks you’ve already added some of these to your #LUTL practice! It’s important to find a routine that fits your lifestyle and works for you… it’s not a one size fits all world. Remember that you are in control of your life and you get to make the choices that make you feel good! Being your healthiest self is one of the best ways to #LightUpTheLOVE.